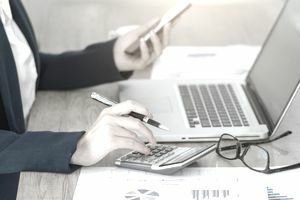 TaxAct may be an ideal fit for someone who's seeking a no-frills, budget-friendly tax filing option online, with the added convenience of a mobile app and live chat for guidance, tips, and tricks. TaxAct provides tax preparation software that's designed to fit a variety of filing needs, ranging from consumers who are looking for a way to file a simple federal return for free to self-employed business owners, freelancers, and contractors who want to maximize every deduction. There are five filing products available for consumers, but for testing purposes, we used the online Deluxe+ version, which TaxAct touts as its most popular option. Dive into our review to learn more about the features, pricing, support, and ease of use to help you decide if TaxAct is the right tax filing software for you. Pricewise, TaxAct's online filing versions are easier on the wallet compared to other tax filing programs. For example, a homeowner would pay $29.95 for the Deluxe+ version with TaxAct while some of its competitors charge $49.99 or $59.99 for the same tier product. One great thing TaxAct offers that some of the other tax prep software companies don't is a Price Lock Guarantee. It's pretty simple: the price you lock in at the time you choose which software program to use is the same price you pay when you actually file. So if you start your Deluxe+ return in February but don't file your return until May, the price won't change. One thing to know, though. You only get this perk with TaxAct's online software products. There are some tax programs out there that come with lots of extras. For example, you might find a program that integrates with TurboTax's ItsDeductible app so you can easily add deductible expenses. There are also programs that integrate with income and expense tracking apps to make tax filing easier for freelancers and independent contractors. TaxAct, unfortunately, doesn't come with those kinds of add-ons. It really is a no-frills filing software that's designed to help you prepare your return. That's good if you want a simple and easy-to-use program but it's also a drawback because one thing you can't do with the online version is import W-2s. That's something many of TaxAct's competitors include with their software programs. If you want to be able to import W-2s, you'll need to spring for one of the downloadable TaxAct versions instead. TaxAct guarantees that its software is 100% accurate so you can get your maximum refund. If it ends up not being accurate, TaxAct will refund your software costs and pay any difference in your lower refund or higher tax liability, plus cover any legal or audit costs up to $100,000. If you're not 100% satisfied with any TaxAct product you can discontinue using it prior to completing the billing step without paying anything. TaxAct download users can get a full refund of any product they're not completely satisfied with within 30 days of receipt. This guarantee doesn't apply after you use the downloadable software to print or e-file a return that's accepted by the IRS or a state tax agency. The TaxAct website gets high marks for being simple to use. To get started with TaxAct, you first choose which online product you want to use, then create an account. You'll need to enter your e-mail and verify your account using a code TaxAct provides. From there, you choose a username and password and select three security questions you want to answer. The final step is agreeing to TaxAct's terms and conditions. This tab concludes with a federal tax summary and an estimate of your federal refund or taxes owed. Similar to the Federal tab, the State tab concludes with a summary of your state filing, including your refund or taxes owed. You'll sign and date your return here. Once you've done that you can view a personalized financial savings report showing future tax savings opportunities. You can also compare your federal returns year over year here and see how your tax filing compares to the national average. Filing: This is where you'll actually file your return. If you opt to e-file, you'll need to enter your payment information. If you'd rather file a paper return, you can print your tax forms from this screen. New Year: This tab walks you through different things you can do to get prepared for next year's tax filing, such as determining your W-4 withholding allowances and estimating your tax liability in different scenarios. Overall, the online site is very easy to navigate, as there aren't a ton of menu options to choose from. Basically, you can file your taxes, update your personal information, verify your login history and use the tax calculator to estimate your return. Bottom line, even if you're brand-new to filing your taxes, TaxAct's online software doesn't overwhelm. TaxAct doesn't offer live chat support for online or downloaded versions. They do offer Protection Plus audit assistance if the IRS flags your return. If you need help during an audit, TaxAct will communicate with the IRS or your state tax filing agency on your behalf, assist with denied credits and tax debt relief and assist with tax fraud. Assistance is available for federal and state audits and covers your return for three years after you enroll and file. The app supports all of TaxAct's online products and you can seamlessly switch from the app to desktop without losing any of your progress when preparing your return. Returns prepared and filed through the app come with the $100K Accuracy Guarantee. You can get personalized product recommendations and notifications when the IRS and state have processed your returns. TaxAct updated its app to cover a wider range of tax situations, such as dependent credits, education credits and deductions, interest and dividend income and the Earned Income Credit. If you want to combine convenience with live chat help, the app delivers both. TaxAct's online tax filing software is best for both first-time and experienced tax filers who want a simple, cost-efficient way to prepare their taxes. It's also a solid choice for mobile users who want the added touch of live chat support on the go.